The ladybird beetle, commonly called a ladybug, perhaps is the most lovely member of the beetle family. They have brightly colored shells in shades of red and orange, decorated with black spots. 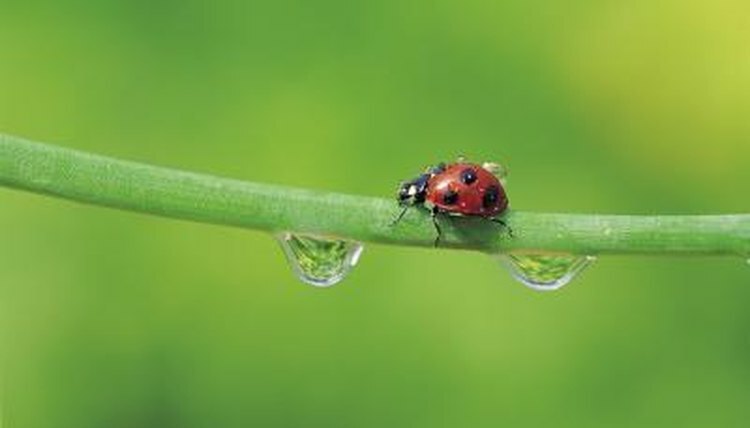 Ladybird beetles go through a metamorphosis, similar to butterflies, transforming from eggs into the familiar colorful beetle inhabiting many a garden. Ladybugs belong to the beetle order Coleoptera. All members of this order go through a metamorphosis during their lives. The first stage of ladybug life is the egg stage. The mother ladybird lays small, yellow eggs in a spot rich in food and protected from predators, typically on the bottoms of leaves. In 3 to 10 days, the eggs will hatch. The temperature outside determines how long it will take for the eggs to hatch. Ladybird eggs hatch in the warmer spring and summer months. When the eggs hatch, what crawls out looks nothing like an adult ladybug. Ladybird larvae have six legs, and a purple-black and orange body covered in spikes. Because of their skinny armored bodies, they are reminiscent of tiny alligators. For the next three to six weeks, their job is to eat as much as they can to store up energy for the next stage in life. Larvae munch on aphids, consuming up to 400 of the tiny critters. Once they’ve fattened up, the ladybird larvae find a safe spot to pupate. Much like when they were eggs, they will attach to the underside of leaves. As pupae, they begin to resemble what they will look like as adults. Ladybug pupae are orange-red with black spots. As pupae, ladybugs are totally defenseless. After a week or two, they transform in to adult ladybird beetles. As adults, ladybird beetles finally can fly. They have two sets of wings: the hard outer shell, called elytra, and the softer wings beneath used for flying. Adult ladybugs live for about a year. During the winter, they will seek a warm spot to hibernate through the cold weather. In the Spring, the adult ladybird beetles fly off to find mates. After mating, the female will lay her eggs, beginning a new life cycle for the next generation of ladybirds.